Saracens and former England fly-half Charlie Hodgson will retire at the end of the season to become the club's head of recruitment. The 35-year-old, who joined Sarries from Sale in 2011, is the Premiership's record points scorer, with almost 2,500 in 239 appearances to date. He won 38 England caps before retiring from international rugby in 2012. "It was a very tough call to make, as being a rugby player is the only thing I've ever known," he said. "In one sense my career seems to have lasted a lifetime and in another sense it's just flown by. "I've been presented with an amazing opportunity to be here at Saracens in a different capacity, and it's an opportunity I felt that I just couldn't turn down." "The majority of Hodgson's international career coincided with a period of under-achievement for the England team following the World Cup win in 2003. However, few could question his qualities as a fly-half. "Blessed with outstanding distribution and a sharp rugby brain, at his best Hodgson was a joy to behold. "His achievements at club level, both with Sale and Saracens, were magnificent, and his class will be sorely missed by Premiership rugby supporters." Hodgson first won the Premiership with Sale in 2006, before lifting the trophy again after Saracens beat Bath in May. He scored 44 points on his international debut against Romania in 2001, a tally which still stands as the most by any England player in a Test match. 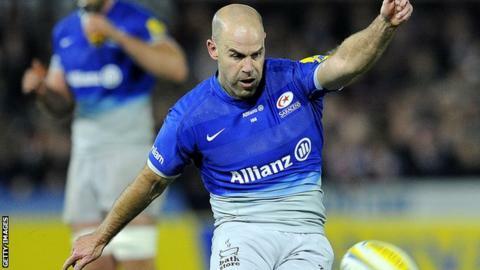 The Yorkshireman has made 77 Premiership appearances for Saracens, but has started only one game this season. "It's great for the club to provide our players with a pathway into a different career," said director of rugby Mark McCall. "As a guy with such rugby knowledge and intelligence, Charlie is tailor-made for the role and he will prove to be a huge asset for the club going forward."